Chinese proper names in brackets are presented in the Pinyin romanization. The Wade-Giles and Pinyin romanizations are given for Nationalist personalities, and Chinese locales during the War of Resistance, if their spellings differ. Other text in brackets represent my off-topic comments. Feel free to comment or correct any errors in my amateurish translation attempt. Unfortunately I can't answer any questions involving historical details, as this is the first time I'm researching the subject myself. I am particularly grateful to the boardmember who found this link. Not only am I also interested in the unit history of the 200th Division during the War of Resistance and Chinese Civil War, but I am currently writing a book on a Chinese Civil War campaign involving a rebuilt 200th Division that is outside the scope of this article. The other parts of this article (timeline, summary OOB and biographical sketches) will be translated later. The terms Jün and Jüntuan are used instead of equivalent translations to avoid confusion. Literally, Jün means "army" (as in the institution or military branch) in both the Chinese and Japanese languages. Technically in both the Chinese and Japanese militaries, it is a grouping of two or more divisions; its western equivalent is the "corps". During WW2 the term Jün was often translated as "army" to denote the formation-type, leading to some confusion. For example, the famous Chinese Communist "Eighth Route Army" (Balujün, whose troops wore shoulder patches with the letters "8RA"), and the Nationalist Chinese "New 1st Army" (Xinyijün, on whose shoulder patches are written "N1A") that fought in northern Burma 1944-45 were actually corps-level formations consisting of several divisions. Jüntuan literally means "army group." In the Chinese army it is a grouping of two or more Jün; its western equivalent is the "army". This division originated as a tank battalion directly subordinate to the Nationalist Military Council (battalion commander Peng Ke-ting [Peng Keding]). In January 1936 the battalion was transferred under the command of the Transport School. In March 1937, the battalion and the 2nd Armored Car Regiment of the Motorized Troop Branch were reorganized as the Armored Regiment (Regimental Commander Tu Yu-ming [Du Yuming]), directly subordinate to the Nationalist Military HQ. In January 1938, the regiment while located in Hsiangtan [Xiangtan], Hunan province was expanded into the 200th Division (consisting of 5 regiments, numbering some 20,000 men), with its original regiment commander Tu Yu-ming taking over as divisional commander. The division was our country’s first mechanized division, and was directly subordinate to the Nationalist Military Council. In April at Shangkao, Kiangsi province [Shanggao, Jiangxi], the division conducted military maneuvers with the 20th Jüntuan, to test the capabilities of mechanized forces. In May, the division detached its tank battalion, engineer battalion, armored car battalion, antiaircraft unit, motor maintenance unit, antitank battalion, and one infantry battalion, to form a spearhead unit (1st Column), which was led north by assistant division commander Ch’iu Ch’ing-ch’uan [Qiu Qingquan] to Lanfeng to engage Japanese forces. Near the end of the month, the column fought at [Guilizhai], [Luowangzhai] and [Sanyizhai], and accompanied by other units pushed back the Japanese Doihara Division [IJA 14th Division, led by Doihara Kenji], recovering the locales of [Quantou], [Shuikou] and [Sanyizhai]. In Jüne, the column was transferred to Kaifeng. Later it was transferred to Chengchow [Zhengzhou]. In September it was in combat at Hsinyang [Xinyang]. Afterwards the unit was moved to Shaanxi province and placed under the command of the 1st Jün, and was removed from the roster of the 200th Division. In November, the division was expanded into the New 11th Jün, its original subordinate mechanized units were placed under direct Jün command, and the division was demoted in status to an infantry division (around 9000 men). Division Commander Tu Yu-ming was promoted to assistant commander of the New 11th Jün, while the 89th Division assistant commander Tai An-lan [Dai Anlan] took over as division commander. After reorganization the division was relocated to Ch’uanchow in Kwangsi Province [Quanzhou, Guangxi] for refitting. In March 1939, the division was relocated to Chiehshou, Kwangsi [Jieshou, Guangxi] to participate in the Armed Forces exercises. The 5th Jün ranked in first place, while the division was ranked second place within the 5th Jün. In September, the division was to be relocated to Hengshan, Hunan, where it was to participate in the First Changsha Campaign. By the time the division arrived the campaign had ended. It was ordered to be reviewed by the 9th War Area commander. In November, the division underwent its second round of training, overseen by the 9th War Area assistant commander Lo Cho-ying [Luo Zhuoying]. In the middle of the month, IJA forces landed at Chinchow Bay, Kwangsi [Yinzhouwan, Guangxi]. The division was hurriedly transferred by truck to Nanning, and along with the 135th Division defended the outskirts of Nanning. In the middle of December, the IJA 5th Cavalry Regiment and part of the 21st Infantry Regiment from the IJA 5th Division occupied Kunlun Pass [Kunlunguan]. The division was ordered to concentrate at Santang to participate in the counteroffensive against Kunlun Pass. When the 1st Honor Division [the unit’s actual honorific name] was forced by severe casualties to retire from the battle, the 200th Division took over, and with tank support continued attacking Kunlun Pass. Near the end of the month, the division had broken up and surrounded IJA units, and cut their lines of communications. In concert with the 1st Honor Division, the New 22nd Division and the 159th Division they launched a general offensive against Kunlun Pass, engaging IJA forces three times for control of Kunlun Pass, and on the last day of the year succeeded in recovering Kunlun Pass. During the campaign, the 600th Regiment Commander Shao Yi-chih [Shao Yizhi] was unfortunately killed in action while attacking IJA positions near Ertang. At the beginning of January 1940, the division had a brief rest at Kunlun Pass before it continued battle around Kunlun Pass with an offensive against Batang. But because the IJA had reinforced their strength, the division after seven days of repeated attacks, and after suffering severe losses, was relieved by the 36th Jün, and was pulled out for rest and refitting. In April, the division because of its excessive losses during Kunlun Pass (losses numbering nearly two-thirds of its troop strength), was relocated to Ch’iyang [Qiyang], Hunan to take on replacements and an extended period of refitting. In Jüne 1941, the division was relocated to Anshun, Kweichow [Anshun, Guizhou]. In December, they were relocated to Paoshan, Yunnan [Baoshan, Yunnan]. At the beginning of March 1942, the division and the Jün organic cavalry regiment, and one engineer battalion entered Burma to support British forces, taking over from British forces in the defense of Toungoo (also called Dongxu). Near the end of the month, the division engaged with IJA troops of the 55th Division north of Toungoo. After three days and nights of vicious combat, they repulsed several attacks by the advancing IJA 112th Regiment 55th Division, but were themselves encircled by the IJA 112th Regiment, with their lines of communications and supply severed. After the New 22nd Division and 96th Division failed to break the encirclement, the 200th Division finally was ordered to break out of encirclement. The rearguard units that covered the division’s withdrawal were all annihilated (died for their country). The 200th Division held Toungoo for 12 days, and held up the advance of the IJA 112th Regiment, forcing it to await reinforcement from the IJA 56th Division. At the same time the division succeeded in covering the withdrawal of part of the 1st Burma Division breaking out of Japanese encirclement. Near the end of April, the division was ordered to attack Taungyi [Dongzhi]. After three days of vicious combat, they drove back the IJA 113th Regiment and retook Taungyi. Afterwards the division pushed to the north of Loilem [Leiliemu]. Soon after Taungyi was retaken by Japanese forces, and Mongnawng [Mengnao] fell shortly after. 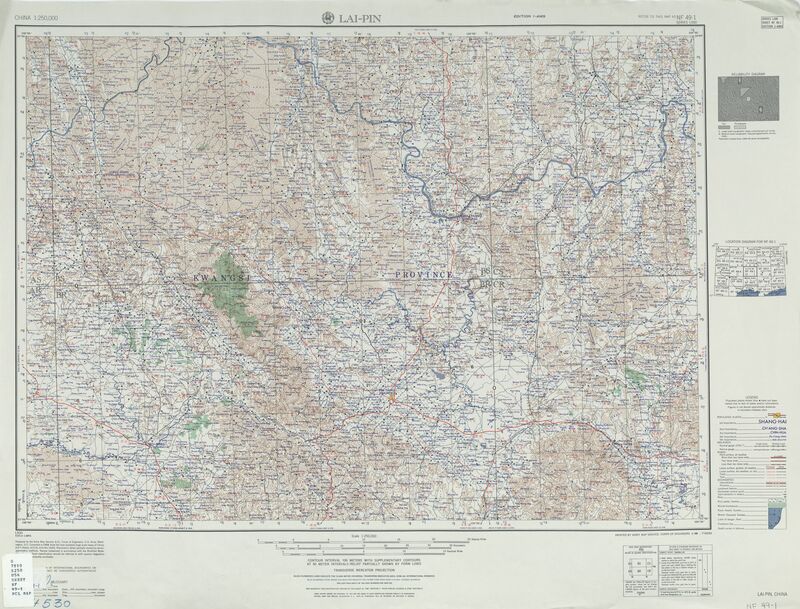 The 200th Division was ordered to send one portion to attack IJA forces in front of Lashio [Lashu], while another portion held Lashio, covering the withdrawal of the 5th and 6th Jün to Yunnan. In early May, the division was withdrawing towards Bhamo [Bamu] and Namkham [Nankan], when it linked up with the 5th Jün replacement units, and took in 1000 men from the 6th and 66th Jün. As the division pushed along the Hsipaw-Mogok [Xibu-Mogu] road, they were ambushed by the IJA 56th Division and were scattered. Regimental Commander Liu Shu-jen [Liu Shuren] was killed, and Division Commander Tai An-lan was severely wounded and rescued by his chief-of-staff Chou Chih-tsai [Zhou Zhizai]. In the middle of Jüne, the remnants of the division finally reached Yungping, Yunnan [Yongping, Yunnan] after an arduous retreat (the 200th Division had lost some 5000 men during the Burma campaign). Division Commander Tai An-lan died of his injuries during the retreat, and was succeeded by assistant division commander Kao Chi-jen [Gao Jiren]. The division had suffered terrible losses during the two campaigns of Kunlun Pass and Burma particularly among leaders and staff personnel. Afterwards the division was relocated to Machieh [Majie] near Kunming, and began a lengthy period of refitting, where the unit would ultimately number some 12,000 men. In August 1944, as part of plans to counterattack against Japanese forces in concert with India-based forces, the division was relocated to and concentrated around Paoshan, then held the front line in support of friendly forces. At the beginning of September, the division went into combat at Lungling [Longling]. As the division entered the battle zone, owing to its unfamiliarity with the combat situation, it blundered into a Japanese counterattack, its 599th Regiment in the lead quickly collapsed under Japanese pressure, and two of its battalions suffered heavy losses including their commanders. Afterwards that regiment was relocated to Hill 5412, where its remnants were ordered to launch a counterattack against Japanese forces, which was also defeated. In the middle of the month, the 600th Regiment and 598th Regiments arrived, and launched a new round of attacks against IJA forces. Supported by artillery fire they retook three hills, and also recovered the old city of Lungling and Wenpi Hill [Wenbipo]. Soon after the division was ordered to defend the area, and to refit its 599th Regiment. In the middle of October, the division supported by the 5th Jün’s engineer battalion, artillery battalion, signals battalion and antitank battalion, began advancing towards Feichuei Hill (Feichuipo) and Laolungtan [Laolongtan]. At the beginning of November, the division after retaking Laolungtan, Shilaohu, and Laoliangtai made a circuitous advance towards Huangshi. In the middle of the month after recovering Huangshi they ran into an IJA counterattack at Mahuang Mountain [Mahuangshan]. After repulsing the IJA advance they followed up their victory with pursuit, and in the beginning of December they recovered Chefang [Zhefang] as they continued their advance, during which they recovered Shuangpo, Lalung [Lalong], Pangta [Bangda], Kungsa [Gongsa], and Hopianchai [Hebianzhai]. In the middle of January 1945, the division in a surprise attack seized the important IJA position of [Huilongshan]. Soon after the division with other units retook the important IJA positions of Hsiangpi Mountain [Xiangbishan], Yaotse Mountain [Yaozishan], and Lengshan. After Wan-ting [Wanding] was recovered by the 2nd Jün the division returned to the outskirts of Kunming. In March, the division was outfitted with American equipment. Division Commander Kao Chi-jen was promoted to assistant commander of the 5th Jün, and was succeeded by the 49th Division Commander Lo You-lun [Luo Youlun]. In April, Division Commander Lo You-lun was transferred to command the 207th Division, and was replaced by Liao Kang who graduated from the American armor school. In August, Japan announced an unconditional surrender, and the division was relocated to Lo-tse [Luoci]. In September, the Kunming Defense Commander Tu Yu-ming was ordered to use force to oust Lung Yun [provincial governor and warlord of Yunnan]. With no resistance the division summoned the Yunnan provincial army’s artillery regiment stationed in their area to assemble, and ordered the 287th Regiment of the 96th Division (temporarily attached to the 200th Division) to disarm the artillery regiment. The 600th Regimental Commander Tung Han [Dong Han] lost his life in a plane crash. In October Tu Yu-ming assumed command of the Northeastern [Manchuria] Pacification HQ, and the division had its 598th Regiment permanently detached to serve as the Pacification HQ Special Services Regiment. The division detached units of its 599th and 600th Regiments to form the cadres for a new 598th Regiment. In March 1946, the 5th Jün was transferred to Wuhan, while the division remained in Kaiyuan, Yunnan, responsible for garrison duties in southern Yunnan, under the command of the Kunming Defense Command. In October, Division Commander Liao Kang took over command of the 45th Division, and was replaced by assistant division commander Hsiung Hsiao-san [Xiong Xiaosan]. In December, the division was sent north to Wuhan, and returned to the control of 5th Jün, where it took over security duties along the road from Chingfeng [Qingfeng] to Puyang. In January 1947, the division was reassigned to the defense of Hsuchow [Xuzhou]. In April, it was ordered to attack Liangshan. After Liangshan was taken by its sister 96th Division, the division served as the left-wing force for the 5th Jün as they pursued PLA forces, but were brought to a halt by PLA blocking forces, and could not advance further. Only after the PLA main forces managed to withdraw across the Yellow River [Huanghe], was the division able to continue their advance, during which the 600th Regiment crossed the river to pursue the PLA. In May, the division was transferred to central Shantung [Shandong], and advanced on [Xintai], in an offensive towards [Yangliudian], assisting the 45th Division in taking [Laiwu], then advancing against [Boshan]. Near the end of Jüne, the division was ordered to cover the left flank and rear of the 11th Division in its attack against PLA forces in the [Yimengshan] area. In July, the division advanced towards [Sishui], where they encountered PLA guerilla units in their rear, and turned back to [Boshan] to pacify the area. Near the end of the month, part of the Reorganized 84th Division was besieged by PLA forces at [Wenshang], and the division was ordered to attack towards [Jining], in concert with the 45th Division to lift the siege. Near the end of August, the division’s 600th Regiment after retaking [Jining] advanced west in pursuit of the PLA, engaging PLA forces ten times at [Lijiagang], [Xujiazhuang], and [Shenguangtun] with success. Shortly after they set off from [Baifotu], and immediately launched a vigorous assault against PLA forces at [Guozhuang], successfully relieving the besieged Reorganized 84th Division. In September, the division was reorganized at [Yuankou] as the 200th Brigade, its division commander Hsiung Hsiao-san becoming the brigade commander. After reorganization the brigade again launched an offensive against [Dinglichang], beating back a PLA counterattack, after which they retook [Dinglichang]. In November, the division [should be brigade] was stationed in western Shantung for garrison duties and refitting. In April 1948, brigade commander Hsiung Hsiao-san became the assistant commander of the Reorganized 5th Division, and was succeeded as brigade commander by the 5th Jün assistant chief-of-staff and concurrent commander of the corps heavy transport regiment Chang Yu-ying [Zhang Yuying]. In May, the PLA attacked [Minquan], and the brigade was ordered to advance along the Lunghai [Longhai] railroad into eastern Hopei [Hebei] to assist friendly forces. In Jüne, the PLA attacked [Dingtao], and the brigade was again recalled to defend Shantung. After returning to Shantung the brigade was concentrated at [Caoxian], then moved against [Malou]. Because the PLA utilized the natural terrain to establish a defensive zone and strongpoints, the brigade slowly and at great cost retook two strongpoints. The Reorganized 200th Brigade slogged with PLA forces for 7 days before retaking [Malou] and continuing their advance. In the middle of the month, the PLA targeted Kaifeng, and the brigade was ordered to the southwest, with the intent of striking PLA forces withdrawing from Kaifeng, but was unable to accomplish their objective. Near the end of Jüne, the brigade was ordered to attack [Taolingang] south of [Qixian]. Because brigade commander Chang Yu-ying had committed his forces piecemeal, they were hit by a vigorous PLA counterstroke, and after one day of attacks, their losses were so heavy that they were unable to advance further. Brigade commander Chang Yu-ying had been called away for interrogation, and was replaced by the Reorganized 96th Brigade assistant commander Chou Lang [Zhou Lang]. At the same time the brigade had been taken into reserve. At the beginning of July, after Ch’u Shou-nian [Qu Shounian] Jüntuan had been annihilated by the PLA, the brigade, less its 600th Regiment left behind to pacify regional PLA units, was ordered to counterattack PLA forces. Soon after, the 600th Regiment and returning units of the brigade coordinated an attack and finally forced back the PLA. In September, when the situation in [Jinan] became critical, the division [should be brigade] was rushed to [Shangqiu], but the unit failed to reach [Jinan] before it fell, and was returned to its defensive zone. Not long after the brigade was redesignated the 200th Division, and Chou Lang became the division commander. At the beginning of November, the division while en route to Huangkou, had one of its battalions surrounded by the PLA, and with the assistance of the 45th Division rescued the unit from encirclement. In the middle of the same month, the division was concentrated at Hsuchow. Afterwards they went to the relief of the 7th Jüntuan [army], advancing along the base of the [Lintong] Hills. Not long after the division ran into a strong PLA blocking force along the slopes of the [Lintong] Hills, and after two days of combat broke through and continued their advance east. Near the end of the month, the 7th Jüntuan had been annihilated, and the division returned to the defense of Hsuchow. When the 12th Jüntuan was encircled, the division began pulling out from Hsuchow. Unfortunately at [Chenguanzhuang] they were encircled by PLA forces. 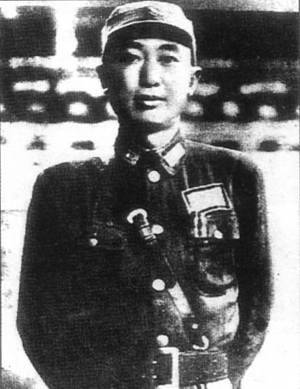 Regimental Commander Liu Ping-yu was killed in action at his CP. After the division occupied the [Zhangmiaotang] area, it became the core of the defense. On January 9, 1949, the PLA launched a general offensive against Nationalist forces at [Chenguanzhuang], and the division was cut off from the rest of the Jün. Shortly afterwards while trying to communicate with Jün HQ, and after receiving the order “Organized combat has ceased, exercise independent action,” division commander Chou Lang began to organize a breakout. However, not long after they were surrounded by PLA forces and annihilated, and Regimental Commander Liu Ming-teh [Liu Mingde] was killed in action; Division Commander Chou Lang, and Regimental Commander Tsai Hsiang-ch’ing [Cai Xiangqing] escorted by their security troops were fortunate to escape encirclement, but were soon captured by local militia; Assistant division commander Ma Hsin-ch’uan [Ma Xinquan] managed to escape under disguise. Of the division only a unit numbering some 500 men led by Regimental Commander Hsiung Tao-tsun [Xiong Daocun] escaped to [Xiaoshui] where they were overrun, and Hsiung Tao-tsun was captured. Edward, thank you very much!!! Thanks for the translation Edward. Much better than the online translations! Lots of new information on this unique formation. Here's the rest of the article (summary OOB, biographical sketches, and sources). Tai An-lan (1904-1942): Native of [Wuwei, Anhui]. Other name [Dai Yangong], nickname [Haiqu]. Graduate CMA, 3rd class. Served as platoon CO in security regiment of NRA HQ; platoon CO in CMA advanced course, 5th class; company CO in 1st Division; area unit leader in CMA; company, battalion and regimental CO in 2nd Training Division; regimental CO in 4th Division; regimental CO and brigade CO of 73rd Brigade, 25th Division; assistant CO of 89th Division, and concurrent staff instructor in 31st Jituanjün HQ; CO 200th Division. Died of wounds May 26, 1942 at Myitkyina, Burma. Kao Chi-jen (1902-1979): Native of [Jingbian, Shaanxi]. Nickname [Shanting]. Graduate CMA 4th class, and graduate of CMA advanced course 3rd class. Served as platoon CO, battalion CO, regimental adjutant in 73rd Brigade, 25th Division; battalion CO in the Regiment of Armored Troops; regimental CO, assistant CO and CO of the 200th Division; assistant CO of 5th Jün; CO Reorganized 70th Division; CO 70th Jün; assistant CO 2nd Jüntuan; CO 5th Jün; assistant CO Kinmen [Jinmen a.k.a. Quemoy] Defense Command; assistant CO Eastern Taiwan Defense District; assistant CO Reserve Army. Retired April 1968. Died of illness August 25, 1979 in Taipei. Lo You-lun (1905 - ?) Native of [Meixian, Guangdong], other name Lo You-lun [different characters], courtesy name Si-yang. Graduate CMA 7th class, Central Infantry School 1st class, and the Army University Regulations Course 15th class. Served as platoon, company CO and training supervisor in the 2nd Training Division; military instructor of No. 1 Chekiang [Zhejiang] Provincial Middle School; Infantry instructor of the Army University; staff HQ chief, assistant COS, COS of administration, and CO transport regiment for the 5th Jün; assistant CO 200th Division; CO 49th Division; CO 200th Division; CO 207th Division; CO 6th Jün; head of Fengshan [in Taiwan] Officers School; assistant head of “Examinations Institute”; CO of Gendarmes; COS Planning for “Ministry of Defense”; CO Marine Corps; Vice COS “Ministry of Defense”; CO 1st Jüntuan; Army Asst CO and Chief of Operations; CO Army Operations Training and Development Branch; Chairman of “Executive Political Operations”; CO “Combined Logistics”; Chairman “Central” Advisory. Hsiung Hsiao-san (1905-1987) Native of Changsha, Hunan; courtesy name Hsiao-san [different characters], nickname [Xiaoshan]. Graduate CMA 6th class. Served as apprentice officer, platoon and company CO in 1st Cavalry Brigade; regimental adjutant 2nd Cavalry Division; regimental adjutant 200th Division; regimental CO New 22nd Division; assistant CO and CO 200th Division; CO Reorganized 200th Brigade; assistant CO 5th Division and then 5th Jün. Command destroyed on January 1, 1949 at [Chenguanzhuang, ending the Huaihai campaign]; fled to Hong Kong. Arrived in Taiwan in 1951 to become Ministry of Defense official, followed by administrator of Shihmen Reservoir. Retired 1971. Died of illness in September 1987. Chang Yu-ying (1908 - ?) Native of [Ruian, Zhejiang], nickname Yu-ying [different characters]. Graduate CMA 8th class, and of British Royal Army Motor School. Served as section and company CO of Military Administration Signals Troops; HQ chief and COS of heavy transport unit; inspector in Kweichow [Guizhou] provincial government; battalion and regimental CO of China Expeditionary Army HQ heavy transport troops; chief of 5th Jün heavy transport troops; COS and CO heavy transport regiment; CO 200th Brigade; COS 5th Jün. Captured December 1948 after defeat on the Huaihai campaign battlefield. Chou Lang (1911 - ?) Native of [Zhanchun, Hebei]. Graduate CMA 7th class. Served as company, battalion and regimental CO in 96th Division; assistant CO Reorganized 96th Brigade; CO 2nd Fast Column; CO Reorganized 200th Brigade, and subsequent 200th Division. Captured January 1949 after defeat on the Huaihai campaign battlefield. That's a pretty good translation! One minor error (in the Chinese source) in the biography of Tai An-lan. he certainly did not die at Myitkyina (it actually contradicts with the Unit History Summary, probably the biography and the unit history are based on different sources). Again, that is really great material, and thank you so much for posting it. If luck holds, my aerial photographs of Toungoo (from 1944) from the U.S. National Archives should be at my mailbox when i get home today. This includes printed and digital versions. If so, I will try and shrink one of them to post-able size and post it here. Attached is a quickie image of one of the three Toungoo area aerial photographs from 1944 that I received from the National Archives yesterday. The photo has the northwestern corner pointed towards the top. 1) it is obvious that what I thought was the city wall from the Google satellite photo was not the wall itself, but the moat. The wall itself is much harder to see. Moreover, it is much more ruined than I thought it was. I did some more research into the wall and discovered that it was in a very ruined state as early as the 19th century. What was done was that the moat was dug, then the earth placed BEHIND the brick wall as a sort of earthen rampart sloping down from the wall to the ground. This actually reinforced the wall considerably and, unknown of course to its centuries-earlier builders, made it resistant to gunpowder/cannons. This allowed the wall to be much more effective than other similar square walls without a corresponding buttress. It also makes claims that the Japanese "breached" the wall unlikely, as it was not just a wall they would have to get rid of, but basically a hill of earth as well. 2) this photo was taken at a different time of year than March-April, and appears to be far wetter than the terrain would appear during the dry season. Other photos, showing more of the surrounding terrain, make this more clear. 3) The interior of the old town is less crowded/congested than I thought it would be. We know the Chinese destroyed part of the city in preparation for its defense. I had thought initially this would be part of the city outside the wall, to clear fields of fire for fighting from the wall, but that was back when I thought the wall was more intact than it was. Looking closely at the photo of the old town, it looks like there are areas of cleared rubble in the southeast section. I wonder if this was part of the city destroyed by the chinese. If so, I wonder what was there before? 4) the British fort is in the far southeast corner of the map; this probably would have still been a good defensive bastion for the Chinese. The railroad separates it from the rest of the town. To the west of the fort is the railroad station. 5) I don't know what that large interesting building is near the northeast corner of the map. It is not the old palace, which was in the center of town. 6) that's a big pond/small lake in the sw corner of the map, created originally by the town's founders for a secure water supply. 7) in this photo, parts of the moat have water, other parts are marshy. This is apparently still the case today, although I have noticed Burmese plans for fisheries in the moat. Just wanted to add the following to the discussion, since as the cliche goes, "a picture is worth a thousand words." This more famous photo of the general is on display in the Martyr's Shrine [Zhong Lieci], Taipei, Taiwan. This 1932 family photo shows (right to left) the general, his wife Tsao Hsiu-ch'ing, and daughter Tu Chih-li (1927-2003). Tu Chih-li was famous for her marriage to the Chinese-American Nobel prize-winning physicist Yang Chen-ning (1922-). Group portrait of senior Nationalist commanders in the China Expeditionary Army sent to Burma. Front row from right to left: Tu Yu-ming, Hsu Ting-yao [Xu Tingyao; the "father of the Chinese Armored Force"], and Huang Chieh [Huang Jie; 1902-1995]. Back row: Ch'iu Ch'ing-ch'uan [1902-1949], Cheng Tong-kuo [Zheng Dongguo; 1903-1991], and Liu Chia-shu [Liu Jiashu; 1903-1972]. General Lo was officially recognized as the fourth superintendent of the Central Military Academy of the Republic of China Armed Forces, and the first one since it was set up in Fengshan, Taiwan. 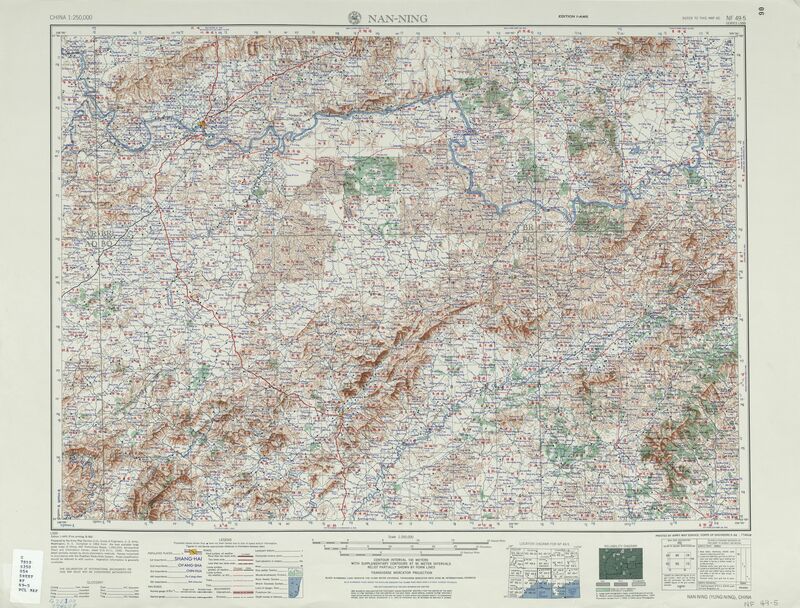 pitman wrote: If luck holds, my aerial photographs of Toungoo (from 1944) from the U.S. National Archives should be at my mailbox when i get home today. This includes printed and digital versions. If so, I will try and shrink one of them to post-able size and post it here. Just curious as whether there are aerial photographs of Chinese cities during the 1937-45 period in the US National Archives holdings and how does one go about searching for this stuff. It is possible that there are aerial photographs of Chinese cities during the 1937-1945 period in the U.S. National Archives, though I would think it is not likely. One possible source would be captured Japanese aerial photographs. I really don't know how much the U.S. possessed, but I think it is not much. The other source that would be in the National Archives would be allied aerial photographs. But for the U.S. in China, most of its aerial reconnaissance probably would have been directed at Japanese cities and targets for its China-based bombing campaign. I don't think they did much strategic or operational bombing in China to support the KMT. So I think the odds are slim. However, there is no harm in inquring. I have always found the folks at the National Archives to be helpful in their responses. I'm curious if anybody has any detailed information about the role the 200th Division played at Kunlun Pass in Dec 1939 to Jan 1940? I have read a number of on-line Chinese-language accounts of the battle, using on-line translators, but they are basically just overviews and only treat the 200th Division in a sentence or two. I am also interested in pictures of the battlefield or terrain in the area, so I can get a picture of what terrain they were fighting over. I have seen photographs of the Kunlun Pass memorial, but not the pass itself, or the various ridges and hills that were fought over. Any assistance would, of course, be greatly appreciated. These two cover the area where most of the fighing went on in the Guangxi campaign. Thanks. I'm looking for photographs of the terrain fought over. To get an idea of the vegetation coverage use Google Earth satilite photos. pitman wrote: I'm curious if anybody has any detailed information about the role the 200th Division played at Kunlun Pass in Dec 1939 to Jan 1940? I have read a number of on-line Chinese-language accounts of the battle, using on-line translators, but they are basically just overviews and only treat the 200th Division in a sentence or two. I have been looking into the role of the 200th Division at Kunlun Pass. To my surprise the description is rather sparse, particularly when compared to the Battle of Toungoo, although Kunlun Pass was hailed as an important victory by the KMT. I think a major reason for this is that the 200th D was responsible for the initial assault, which did not went too well, and the decisive thrust was provided by another division. I will have my hands on the full Chinese translation of the Senshi Sosho account of the battle soon, and I can hopefully post a composite account based on both the Chinese and Japanese views.